Ulster flanker Stephen Ferris said a strong defence was key to the 22-16 win over Munster in Sunday's Heineken Cup quarter-final in Limerick. Ferris, who was named man of the match, overcame an ankle injury to put in another impressive display. "Our defence won it - I don't think they had a line break in the whole game and as a team we were outstanding in that area," said Ferris. "It was a great team effort and we've put out a statement to European rugby." 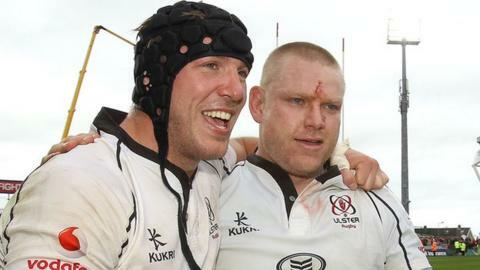 Ulster face Edinburgh in the semi-finals in Dublin on 28 April. He added: "The Munster boys came out at us and with the crowd behind them we knew it was going to be a long afternoon. "But we made a terrific start with Ruan (Pienaar) kicking the penalties over. "Edinburgh have showed they are a good side and it's going to be tough, but we're looking forward to it." Munster captain Paul O'Connell believes his team failed to make the most of their possession. "We conceded 19 points early in the game and gave ourselves a massive hill to climb," said the Ireland lock. "We probably had enough possession to climb that hill but we didn't do enough with it. "We made a lot of mistakes and from this lost territory and momentum."